Lima is the capital of Peru and the largest city in the country, with over 7 million inhabitants. The city was founded by the Spanish conqueror Francisco Pizarro on January 18, 1535. It is also known as the “City of Kings” and was declared Cultural Heritage of Humanity by UNESCO. Lima constituted the political, commercial and religious center of America during the Spanish colony. It has numerous tourist attractions among which are its Catedral, numerous churches, colonial palaces and houses, museums and archaeological sites. Most hotels and travel facilities are located in Miraflores, as well as in the neighboring quarter of San Isidro, both having comercial, residential and financial areas. Our hotel selection is also concentrated in these two districts due to its safe and nice environment. Restaurants, cafes, parks and the most famous Andean crafts markets are also located in the same area. The international airport is approximately 25 to 45 minutes away from the area. The Miraflores Park Hotel, with its 82 rooms, is a small boutique hotel, set in a park on the edge of a cliff overlooking the sea and affording almost all of the rooms with stunning sea views. The Hotel is dedicated to provide state-of-the-art facilites for business travellers in a ‘home away from home’ atmosphere. The service is very personalized, the rooms are large and opulent and the attention to detail has won the hotel many awards. Diverse conference facilities are available in addition to the Dr Jekyll and Mr Hyde Bar and the acclaimed Restaurant Poissonnerie. The hotel also boasts The Observatory restaurant, with marvelous ocean views, a swimming pool, gym and 3 new massage rooms. In March 1999, Orient-Express Hotels entered into a joint venture with Peru Hotel S.A. to acquire the longterm concessions of the Hotel Monasterio in Cuzco (Cusco) and the Machu Picchu Sanctuary Lodge. 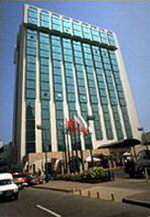 In January 2001, Orient-Express Hotels, Trains & Cruises acquired the Miraflores Park Hotel. A member of Orient Express. The Country Club Lima Hotel, a five star luxury property, is located in San Isidro, the most exclusive residential and commercial district in Lima, right in front of the Lima Golf Club. Housed in an elegant old mansion that was the most exclusive club and hotel of the Lima elite in the 30´s, the hotel was built in 1927, completely refurbished in 1998, and is now considered a National Monument. The 78 spacious suites are elegantly decorated with a stylish mixture of classical and Peruvian colonial artwork. Each of the Suites and public areas feature original artwork from the famed Museo de Osma. All the suites are equipped with King size beds, a working area, minibar, three telephone extensions, voice mail, electronic security box, 110/220 voltage, 25” cable TV, dataport and Internet access, AC and heating system. Restaurant, coffee shop, bar, outdoor swimming pool, gym, sauna. This is one of Lima's best and most modern hotels. Inaugurated in 2000, it stands upon the grand cliffs in the commercial district of Miraflores, right in front of the Ocean and walking distance from shopping, eating and offices. All 300 rooms on the 25 floors of this impressive high-rise boast ocean views. Excellent service. Junior suites have ADSL internet access and stereo/DVD player. All rooms have 2 telephone lines, voice mail, and lines for modem access. An elegant and modern hotel located in San Isidro, the Swissôtel Lima offers 244 finely appointed rooms and suites across 18 floors. Close to shopping and commercial centres, the hotel offers 3 restaurants, a Lobby Bar and a Gourmet Deli Shop, as well as a heated outdoor swimming pool, a beauty salon, jacuzzi, sun salon, sauna, steam room and massage service. Also oriented towards business travelers, the hotel has excellent meeting facilities. Small, tastefully decorated and pleasant. Well priced. 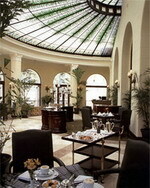 One international restaurant, Sushi bar , coffee shop, bar, swimming pool on the hotel terrace, spa and gym. Popular with business travelers and up market tour groups. 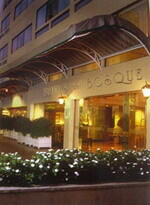 Located in San Isidro, the fashionable commercial and financial Centre of Lima, in the midst of a lovely Olive tree park. Quiet location. This hotel of modern architecture and exclusive style is located in the cultural and financial heart of San Isidro. Belonging to the Accor hotel chain, the Sofitel Royal Park offers an impeccable service, modern, comfortable rooms, international cuisine, bar, business center, swimming pool, gym and sauna. A member of the Accor Group. Excellently located in front of the Golf Club gardens, the hotel has 15 rooms and 38 suites including internet connection, minibar, 24-hour room service, direct telephone dialing, and cable TV, among others. 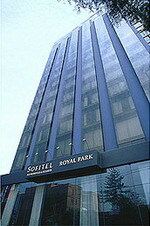 The hotel is one of the 7 hotels that this chain has in Peru, all offering professional service and excellent locations. A member of the Summit Group. Las Americas Hotel & Suites excellently located in the center of Miraflores and is a good option for both tourists and business travelers due to its large number of facilities. Five star services and amenities are provided to all rooms and suites, including air conditioning, digital safeboxes, cable television, minibar, round-the-clock room service, three telephone lines, voice mail and modem connections, among others. Comfortable, modern hotel in the very centre of Miraflores. 24-hour room service, cable TV, wireless internet access, international direct dialing, among other amenities. Good value for money. Excellent gym. A member of the Hilton Family Hotels. Located in the residential district of San Isidro, close to a commercial and financial area, this is a very functional hotel, with its rooms decorated in a contemporary style, including internet access, cable TV, kitchenette and AC. Casa Andina is one of the largest hotel chains in Peru, offering 3-star bed and breakfast accommodation and 4-star hotels (Private Collection series) in most main cities in the country with an excellent quality-price relationship. All hotels ensure the same high quality of service, have a professional, friendly staff and are nicely decorated in a cozy, somehow rustic-native style. The Casa Andina Miraflores Centro Hotel is located just a few steps from the Handicraft Market and Miraflores Central Park, in a comfortable tourist area surrounded by cafes, restaurants and shops. Casa Andina Miraflores San Antonio Hotel is the second B&B option from this hotel chain in Lima, located just a few blocks from downtown Miraflores, one of the most traditional quarters of the city. Its safe environment, commercial atmosphere and friendly staff makes it an excellent option. Located in the heart of San Isidro, Lima's elegant, commercial and residential district, conveniently close to restaurants, museums and shopping centers. Rooms are well equipped with kitchenette, minibar, safe deposit box, Internet access and air conditioning. Located in the heart of Miraflores and belonging to the Best Western hotel chain, all rooms are equipped with free internet access, national and international telephone direct access, fax and modem conection, 21” Cable TV, heating, AC, minibar and hair-dryer. A member of Best Western. Good location in the center of Miraflores, good service, modern rooms carpeted and comfortably equipped with color cable TV, AC, safe deposit box, and minibar. This bed & breakfast type hotel is located in the Miraflores district, just a few steps away from the main commercial Larco Avenue and near Larcomar shopping center. Simple, confortable and safe. Once home to the Peruvian sculptor Víctor Delfín, this charming guesthouse is strategically located overlooking the Pacific Ocean, conveniently nestled in the heart of Barranco, Lima’s arts district. The hotel has five bedrooms with private bathrooms, all offering different views and a lovely cozy decoration.